The impact of human activities on the environment – and on climate change in particular – are issues of growing concern confronting life on Earth. Concurrently, information and communication technologies (ICTs) are being rapidly deployed around the world. Although ICTs require energy resources, they also offer opportunities to monitor, learn about and protect the environment, reduce carbon emissions, and mitigate climate change. ITU initiated a bold new work programme in 2008 with its strategy on ICTs and climate change, to ensure that the vital role of ICTs is taken into account in global strategies to address climate change. As part of this strategy, ITU-D Programme 3 is developing reports, toolkits and educational material to raise awareness among its Member States on climate change and the role ICTs can play in combating it. Following its mandate to develop practical tools for Member States, ITU has developed an E-Environment Toolkit that will provide policymakers principles and guidelines for the development and deployment of electronic applications and services in the area of the environment. The objective of the initial module of the Toolkit is to help countries to assess the potential contribution that ICTs can make to reduce energy consumption and green house gas (GHG) emissions and to support Member States in the evaluation of their current capacities, the identification of needs and definition of priorities, as a basis for the development of national e-Environment and e-sustainability strategies and action plan for climate change and sustainable development. A core practical tool in this Toolkit is the e-Environment Readiness Index (EERI). The EERI can be used both as a tool for evaluating the e-Environment readiness of a country to use ICTs for mitigating and adjusting to the impacts of climate change, as well as a process for establishing baseline knowledge about the potential use and impact of ICT systems with respect to the environment. What is the e-Environment Readiness Index (EERI)? to make beneficial use of ICTs to mitigate and adapt to environmental change, including climate change. The purpose and mandate of ITU-D is to organize seminars, workshops and other events in order to heighten awareness amongst all concerned. Carry out pilot projects at national, sub-regional and regional levels. Envisage the establishment of a framework for international cooperation which will enable all those concerned (governments, manufacturers, private sector, international organizations, United Nations Specialized Agencies, etc.) to carry out, promote and develop projects to ensure optimum use of the most appropriate telecommunication and information technologies for the protection of the environment and sustainable development. Assist Member States in the development of ICT applications and ICT strategies on environmental protection. To assist United Nations agencies and other entities to disseminate information on best practices in the area of environmental protection. Within the Development Sector, Study Group 2 focuses on the issues of climate change emerging as a global concern and requiring global collaboration by all concerned, in particular the developing countries (which are the most vulnerable group of countries with respect to climate change). Question 24/2 undertakes studies regarding international initiatives in this domain, which are seeking to develop sustainable development and identify ways and means in which ICTs can monitor such climate change and reduce overall global greenhouse gas (GHG) emissions. Within the Standardization Sector, Study Group 5 (SG5) is responsible for studying ICT environmental aspects of electromagnetic phenomena and climate change, as well as responsible for studies relating to protection of telecommunication networks and equipment from interference and lightning. SG5 also carries out studies related to electromagnetic compatibility (EMC), to safety and to health effects connected with electromagnetic fields produced by telecommunication installations and devices, including cellular phones. Study Group 16 leads the ITU-T work on multimedia (MM) terminals, systems and applications, including the coordination of the studies among the various ITU-T Study Groups. It is also the lead study group for ubiquitous applications (“e-everything”, such as e-health and e-business). The Focus Group on ICTs and Climate Change was created to identify the impact of ICTs on climate change from the standardization viewpoint and within the competences of ITU-T. In particular, the Focus Group, whose work concluded in May 2009, examined how standards can contribute to the reduction of ICT’s own emissions over their entire lifecycle (direct impact), the mitigation that follows through the adoption of ICTs in other relevant sectors (indirect impact), and ways to facilitate the monitoring of relevant climate parameters. 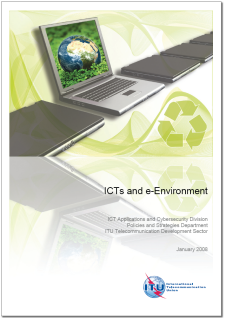 To respond to the needs of ITU Member States and carry out its mandate in this domain, the ITU is undertaking a number of initiatives to support the responsible use of ICTs for environmental action. As one example, ITU together with the United Nations Environment Programme (UNEP) supports an initiative of ICT service providers and suppliers called the Global e-Sustainability Initiative (GeSI). The mission of this initiative includes creating a better understanding of the impact and opportunities offered by evolving technology in the context of a fast-growing information society, and providing individuals, businesses and institutions with sustainable solutions to the challenge they face in their attempt to maintain the fragile equilibrium between economy, ecology and society. The partners in this initiative provide direct assistance countries on policies and strategies for the harmonized co-existence of man and the environment through the use of ICTs. 16-18 September 2009 (Geneva, Switzerland): ITU/WMO Seminar "Use of Radio Spectrum for Meteorology: Weather, Water and Climate Monitoring and Prediction"
13-14 March 2008 (New York, United States): Ethical Sourcing Forum North America - Enabling Tomorrow, Today!